Every homeowner is unique with personal tastes and styles. It is up to each homeowner whether or not they are building their new home with plans to sell it down the line or if it is their “forever” home. Here are a few areas in your home that will bring the best return on investment (ROI). CURB APPEAL – The exterior façade of your home is important! Before someone even enters your home, they are going to see the outside. You want to make sure your home conveys a sense of welcome for your guests. 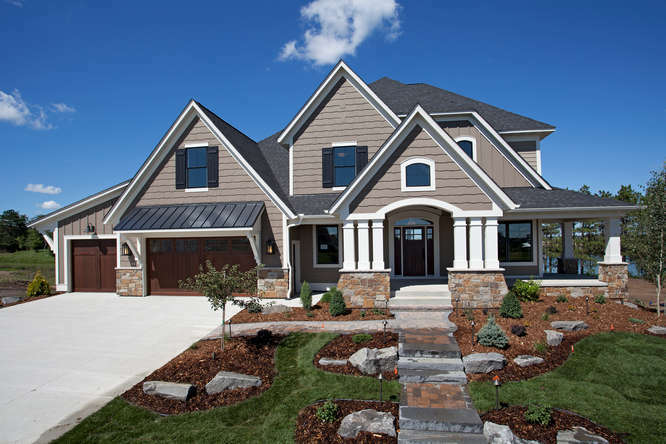 Spend time picking your color scheme and a siding material that is low maintenance and will last. Picking LP siding over vinyl is what we recommend. KITCHENS – The kitchen area is one of the first things any homeowner looks at. This space is a focal point in your daily life and a gathering point in open concept floor plans. When picking out your selections, thinking “traditional” is a safe bet. Doing something that is unique/trendy appeals to a niche market and may make it harder for you to find a buyer in the future. Another feature that appeals to customers is granite countertops. Granite is appealing to the eye and extremely durable compared to vinyl, tile, or wood. Complete the space with a nice light fixture and your kitchen will be complete. BATHROOMS – Having spacious bathrooms is always a plus. Spending the extra money to put ceramic tile in your shower instead of a standard fiber glass insert will increase the value of the space at re-sale. Double sinks is another feature that is highly requested by homeowners in a master bathroom. MUDROOMS – For families with children, mudrooms are becoming a must-have. It is the perfect “drop-zone” for all things messy. When selling your home, it is good to have a mudroom space that allows for unloading when you come home. CLOSETS – Walk-in closets are becoming a norm in new construction homes. To boost your closet’s value, consider melamine instead of wire organizers. It is a small cost to upgrade, but a substantial return on the investment. MAINTENANCE – No homeowner wants to deal with mechanical issues. Study your options for low voltage, plumbing and heating/AC to make sure you are getting a product that is going to give you a long service life and efficient performance. Spending the added costs to get a more energy efficient product also saves you on monthly bills. Other factors that play into your ROI include wall colors, custom niche features, and lighting. For inspiration, check out some photos of our custom homes. For any other information/questions, please email info@homesbytradition.com or call 952-322-8700.